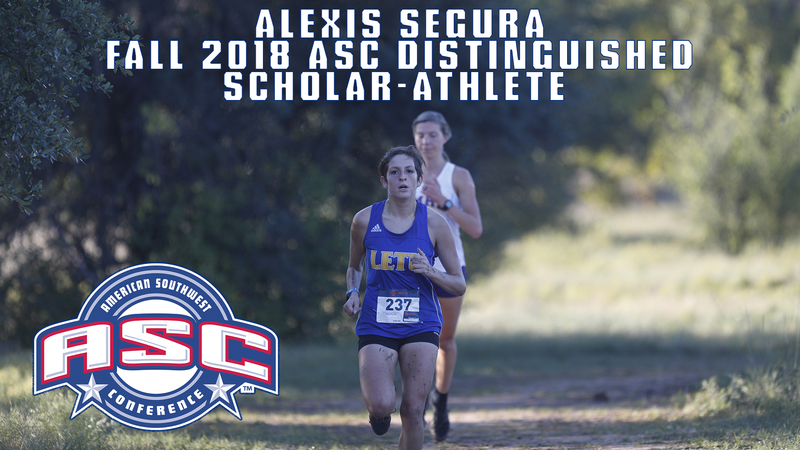 Alexis Segura Receives ASC Distinguished Scholar-Athlete Award; Four Other LeTourneau Student-Athletes Named To Distinguished Scholar-Athlete Team. RICHARDSON, Texas – LeTourneau University junior women’s cross country student-athlete Alexis Segura has been named the American Southwest Conference Fall 2018 Women’s Cross Country Distinguished Scholar-Athlete the ASC offices announced on Friday, February 8. Segura joins six other student-athletes three other ASC member Universities and one affiliate member institution with student-athletes earning the award for fall 2018. Overall, 70 student-athletes including five LeTourneau Student-Athletes were named to the American Southwest Conference 2018 Distinguished Scholar-Athlete Teams which recognizes student-athletes who achieve a high level of academic achievement (a 3.20 grade-point average or better) while competing as a starter or important reserve on their team. The Austin, Texas native becomes the second women’s cross country student-athlete from LeTourneau to earn the award, with the late Nicole Leman earning the award following her senior season in the fall of 2012. Segura was the 2018 ASC Women’s Cross Country Championship Medalist and won four of the six meets that she competed in this past fall while placing 11th at the NCAA Division III South/Southeast Regional meet. The 11th-place finish was the highest finish of any ASC athlete and tied the LETU record for the best individual finish at the regional event with Leman. Segura was named ASC Cross Country Runner of the Week twice in 2018 and also had an impact on the soccer field for the YellowJackets by helping LETU make the American Southwest Conference Tournament Semifinal for the first time in school history while earning Honorable-Mention All-ASC honors. The daughter of Jennifer Segura, Alexis has a 4.00 GPA in Kinesiology-Sport Management. Other student-athletes to be named to the 2018 Fall Distinguished Scholar-Athlete Teams from LeTourneau include Michael Field (Men’s Cross Country), Alec Wier (Men’s Soccer), Sarah Harder (Women’s Soccer), and Cam Taylor (Volleyball). Field finished as LETU’s top finisher in three of the six meets that LeTourneau competed in and was the top YellowJacket finisher at the ASC Championships (15th) to earn second-team All-ASC honors. Wier helped lead LETU to the ASC Tournament for the first time since 2011 and served as team captain this past fall as the YellowJackets earned their most wins since 2011. The season would also see the longest winning streak since 2005 for LETU as Wier would be named Honorable-Mention All-ASC. Harder finished her LETU career as a four-time All-ASC selection which includes a Second-Team All-ASC pick and All-Tournament Team selection in 2018… The Pearland, Texas native is part of a senior class that became first in school history to qualify for ASC Tournament all four-years while helping the YellowJackets advance to ASC Tournament Semifinals for the first time in school history in 2018. Harder would also become the first female student-athlete in LETU history to earn CoSIDA Google Cloud First Team Academic All-American honors after being named just one of 11 women’s soccer players across NCAA Division III to win the award. Taylor would start 26 of 28 matches this past season for LeTourneau, appearing in 98 sets and leading the team in assists with 456. The Huffman, Texas native finished second on the team with 27 service aces and was an ASC East Division Honorable Mention selection this past fall. LeTourneau Softball Uses Exhibition Against Japan National Team As Tune-up For 2019 Season. 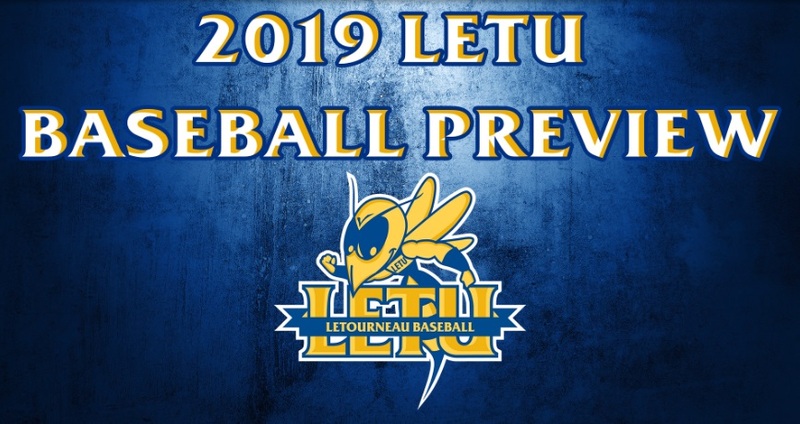 LONGVIEW, Texas – With the 2019 NCAA Division III softball season last Friday officially getting underway, the LeTourneau University softball team is set to kick off their 2019 campaign at home on Saturday with a 12:00 p.m. doubleheader against Schreiner University. The YellowJackets, who will enter 2019 under third-year head coach Stan Wells, have been practicing for nearly three weeks and were planning on using the time frame to find a starting lineup with 17 newcomers to the squad to go along with three returners. The Yellow Jackets made the most of the three-week pre-season, it would be by chance that the LeTourneau softball team would be given the opportunity to be the only NCAA Division III team to take on the Japanese National Team as part of their tour across the United States this spring. LeTourneau took on Team Japan on Tuesday at the Scrap Yards in Conroe and joins the likes of NCAA Division I Programs South Florida, Louisiana-Lafayette, and Nebraska who will also play against Japan this spring in exhibition contests. The YellowJackets made the most of their opportunity to play the top team in the world while also using the exhibition to learn more about Japanese culture. In addition to the game, the two squads would exchange gifts before first pitch and be able to play a sport that they love despite language barriers that existed between teams. The YellowJackets will hope to use the opportunity as a learning experience and a way to kick-start their season which includes a 30-game American Southwest Conference slate. LETU will also face off against last year’s NCAA Division III Softball World Series participant UT-Tyler in non-conference action, as well as three other teams that qualified for last year’s NCAA Tournament. If nothing else, LeTourneau will be able to say that for one sunny afternoon in early February that they were ready to serve as adversaries to the best of the best when it comes to international softball. LeTourneau Men’s Basketball Holds Off Louisiana College For 91-77 Road Win. PINEVILLE, La. – Scoring 10 of the first 11 points of the game and 13 of the final 21 points in the contest, the LeTourneau University men’s basketball team picked up a big 91-77 road victory over Louisiana College at the H.O. West Field House in Pineville, Louisiana on Thursday, February 7. LeTourneau now sits at 15-7 overall and 9-4 in the American Southwest Conference while sweeping the season series from the Wildcats who fall to 16-6 overall and 9-5 in ASC action. Freshman Elijah Gerber would make significant contributions in the opening minutes as a Nate West triple would be followed by a layup, block, rebound, and three from Gerber to force an LC timeout with 18:09 left in the first half. After Louisiana College would get on the board with a free throw, West would hit on a fast break jumper in the paint and would be followed up by an Andrew Eberhardt triple as the YellowJackets would fire on all cylinders to grab a 13-1 lead less than three minutes into the game. The LETU lead would grow to 16 at 19-3 following a West triple before seeing Louisiana College on a 7-0 run to close the gap back down to single-digits at 19-10. LeTourneau would manage to keep their lead in double-digits throughout the next several minutes of play and threaten to extend their lead past the 16-point margin held early on but would see the Wildcats manage to hang around despite the 10-plus point deficit. Three-point shooting would be a big boost for LETU to open the lead by going seven-for-11 from beyond the arc to start the game as the YellowJackets would grab a 49-38 lead at the break. Kae’Ron Baker for Louisiana College and Caleb Loggins for LeTourneau would have a back-and-forth start to the second half by trading the first four buckets of the period to keep the LETU advantage at 11 two-plus minutes into the half. A bit of a scoring drought would then find its way to the YellowJackets as Louisiana College would close the gap to as few as five at 53-48 before seeing Eberhardt connect on a three to push the lead back to eight. The back-and-forth between teams would continue as LC would get the gap down to four at 59-55 with 14:02 remaining in the game but saw LeTourneau score six of the next eight points to go back up nine over the next four minutes of action. 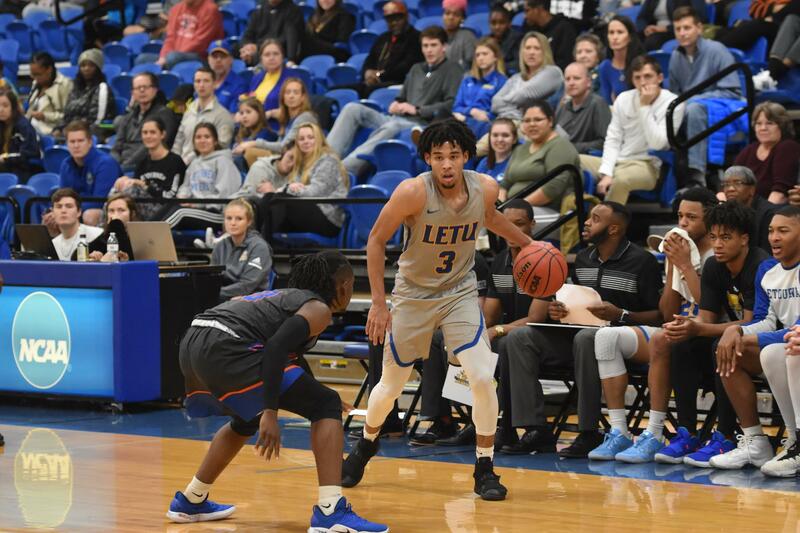 LETU would then push their lead back to the double-digit mark by trading two-point Louisiana College baskets with three-point baskets of their own and look to put things away early after holding a 76-62 lead with 7:25 remaining. Louisiana College would make one more run at the YellowJackets to cut the 14-point lead in half over the next 1:11 of action but see LeTourneau respond with a 10-1 run to match their most significant point of the game at 86-70 with 3:44 remaining. Free-throw shooting would then allow the YellowJackets to limit the Wildcats to just a 7-5 advantage in the final minutes as LETU would avoid needing late-game heroics as they did in Longview against LC. The starting lineup for LeTourneau would play a significant role in the victory as the YellowJackets scored just three bench points in the game while getting double-digit points out of four of the five starters. West (25 points) and Loggins (24 points) would be the top two scorers in the game while adding eight and seven rebounds each despite Louisiana College holding a 52-42 advantage on the glass. Turnovers would also loom large in the contest as the YellowJackets forced 17 Louisiana College turnovers and scored 22 points off turnovers while allowing the Wildcats to score just 12 off nine LETU turnovers. LeTourneau will play one more road game on Saturday, February 9 at Belhaven University with tip-off scheduled for 3:00 p.m. The Blazers suffered an 84-83 defeat at the hands of East Texas Baptist University on Thursday evening. 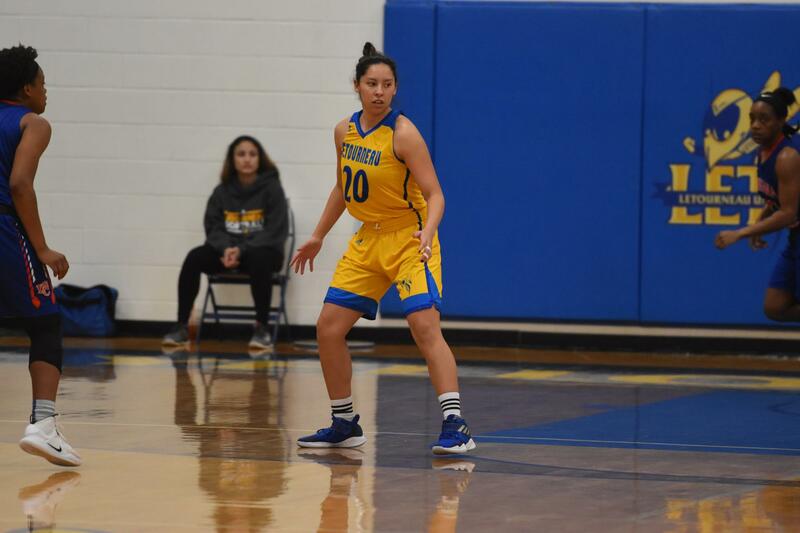 PINEVILLE, Louisiana- After leading by as many as 18, the LeTourneau University women’s basketball would see a late Louisiana College rally force overtime before falling by a final score of 61-58 at the H.O. West Field House in Pineville, Louisiana on Thursday, February 7. The YellowJackets drop to 5-17 overall and 2-11 in American Southwest Conference action while the win allows the Wildcats to move to .500 with a 7-7 conference record while they sit at 10-11 on the season. The YellowJackets would be quick to jump on the Wildcats as they used a seven-point first quarter performance from Keauna Whitfield to grab a 15-6 lead heading into the second period. The LeTourneau offense would look to build on their lead as they earned the first six points of the quarter as Louisiana College didn’t see their first basket of the second period until 5:45 remaining in the first half which allowed LETU to open a 21-8 lead. After a series of turnovers exchanged between both squads, a jumper from Alexandria Thorne would be the last points of the half to give the YellowJackets a 25-13 lead heading into the break. A foul-happy third quarter led to six trips to the free throw line for the Wildcats as they converted on all six free throw attempts to pull themselves within single digits as the third quarter ended. The final minute of action in the third quarter saw the two teams combine for a total of seven points with the YellowJackets holding a 43-34 advantage. The charity stripe would continue to be a boon for the Wildcats as Louisiana College would score four of their first 10 points at the free throw line to pull within four at 48-44 before seeing LETU respond with a Chauntel Acosta layup to go back up six with 5:35 left in regulation. LC would manage to make another run and close within a single point at 51-50 with 3:15 left in the fourth quarter. After seeing Louisiana College knot things at 52-52, LETU would get a layup from Olivia Eweni to make it 54-52 with 1:07 left in regulation but the Wildcats would answer as they scored with 24 seconds left before holding strong on defense to push the game into overtime. The opening minutes of the extra period would see the two teams combine for eight points and leave the score tied at 58-58 with 2:44 remaining in overtime as turnovers would start to become an issue for the YellowJackets. Two of the final three possessions for LETU would come without a shot attempt as Louisiana College would once again turn up the pressure and score the final three points of the game to earn a 61-58 victory. LC would see 25 of their points come off turnovers by the YellowJackets while LETU would turn 15 Louisiana College turnovers into 13 points. Thorne would see her second-best shooting performance of the season to finish with a team-high 23 points to go along with eight rebounds while Acosta added 12 points and eight rebounds of her own. Shooting percentage would reflect the neck and neck contest as the YellowJackets shot 35.0 percent (21-of-60) from the field while the Wildcats connected on 33.8 percent (23-for-68) of their shots. The YellowJackets will play their last road game of the regular-season continue east to Jackson, Mississippi to take on Belhaven University on Saturday, February 9th at 1 p.m. Belhaven will enter Saturday’s matchup with a 7-14 overall record as LeTourneau will look to sweep the season series against the Blazers.